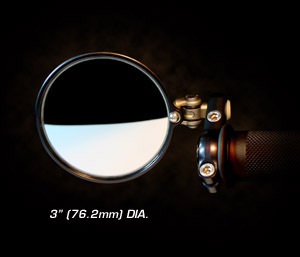 The Hindsight LS (Lane Split) Bar End Mirror was created by adding the folding / retractable feature to the original Hindsight. There are two primary benefits of the retracting bar end mirror—added clearance during tight riding conditions, and reduced width for bike storage. Simply pull in the bezel of the mirror to create additional clearance, then fold the bezel back out against its positive stop in the full open position and the sighting of the mirror returns perfectly to its rear vision position. The detent folding mechanism is calibrated to retract should the mirror contact an immovable object, thus allowing forward motion without disruption of steering control. The pivot of the hinge features a ball / spring detent which holds the mirror bezel in the full open or full retracted positions. The pivot also features dust rings that provide for years of maintenance free operation. The Hindsight LS is available as a complete assembly or can be purchased separately to retrofit an original Hindsight Mirror. As with the original Hindsight we use custom convex glass formed to our own specification to give you the perfect balance between field of vision and image magnification. To reduce glare, the glass has an automotive quality mirror tinting. Rubber mounting helps the glass resist vibration. The lightweight but sturdy construction allows the Hindsight Mirror to be positioned for optimal viewing without concern of movement during high speed runs or excursions over rough roads. CRGmoto | Constructors Racing Group, LLC | Made in the U.S.A.